Artisan Chirada Loetparisanyu presents a chic shoulder bag crafted with cotton and leather by hand. 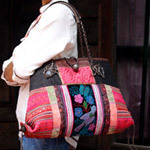 Its exterior is dressed with colorful patterns woven, embroidered and stitched by hand by hill-tribe women. The interior is lined with velvet and features three convenient inner pockets, one for cell phone, one with a zipper. It closes with a zipper and is further secured with a hoop over an aluminum ball. The shape of the lower corners can be slightly altered by pulling on the braided leather cords placed on the sides. Braided leather handles complete the design. 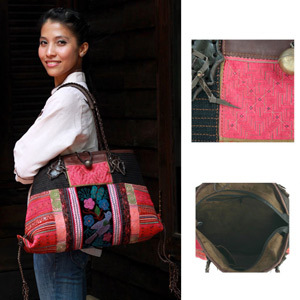 A lovely ethnic addition to any contemporary outfit. Materials: Velvet (cotton) 45%, cotton 45% and leather 10%. Aluminum bead.